I’m so excited showcase my newest nail post – sponsored by the amazing folks at Collective Bias® for Sally Hansen. I’ve been fascinated by all the new nail textures popping in the market. Sally Hansen has just released two new texture nail polish lines out – the Sugar Coat and the Fuzzy Coat. I’ve had my eyes set on getting my hands on some of the Sugar Coat polishes. 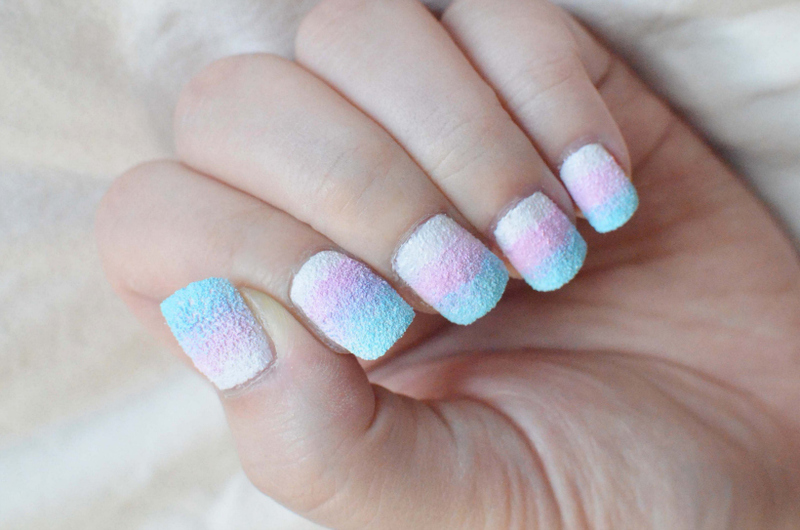 They dry to a matte 3D sugary texture. It’s been quite a hot item here in New York. I had to run to several Walgreens (they have a buy one get one half off deal until 6/29!) stores to find certain colors in stock. 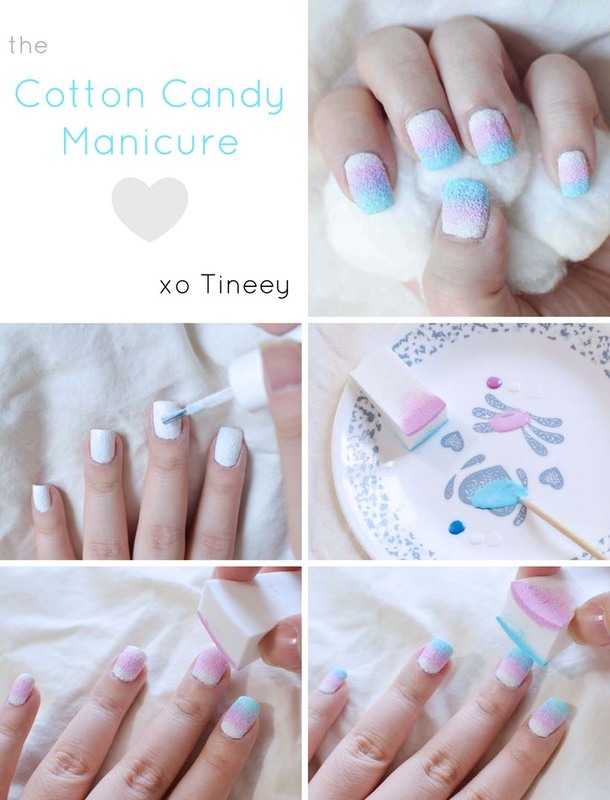 The combination of the sugary texture and the colors available in the Sugar Coat line lead me to think COTTON CANDY. Summer is the time for carnivals and cotton candy snacks, naturally. So, I was shopping at almost every location for the specific colors to get the look down. Apply a layer of base coat. Apply two thin layers of Sugar Fix. Create my color palate by mixing the pink and blue colors with the white in a 1:2 ratio of color:white. Dab onto nails with the Bubble Plum mix first to the middle 1/2 of the nail with the sponge. 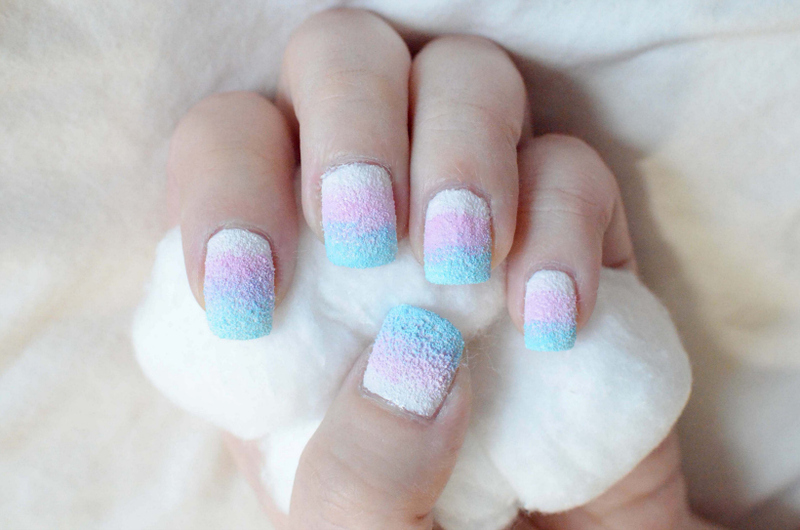 Repeat with the Razzle-berry mix to the lower 1/2 of the nail. You will see a gradient forming using this technique. Also, to avoid mistakes, go light on the dabbing and build the color up afterwards. These polishes dry really fast which makes the whole process much easier. No nail jail here! Graphic Print Maxi Dress + Madison Square Eats White Mesh & Lunch w/ boohoo!